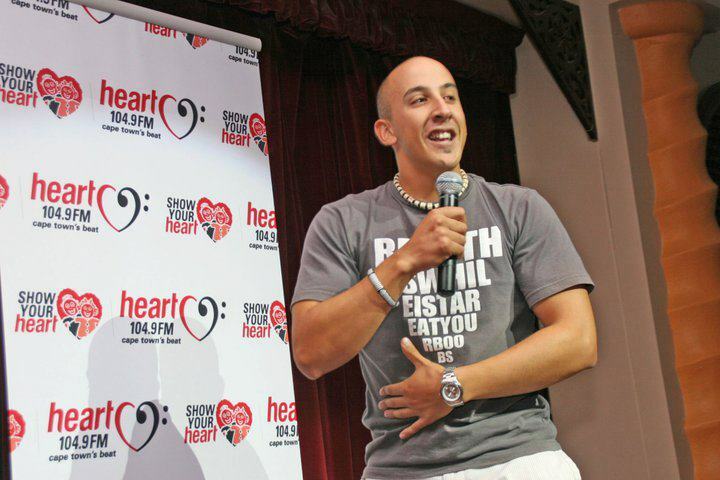 New Spotlight: Will the real Dalin Oliver please stand up? Dalin is the tall, light-skinned bald guy many of us see on campus. I actually see him quite often, on Jammie Stairs, and even in the library. He has one of those faces you just recognize and wonder to yourself, “Don’t I know this guy from somewhere?” Quite a few of you should know him outside of the concrete walls of UCT, on stage. By day Dalin Oliver is a student, by night, he is ….. a stand-up comedian. He goes on further to say: You know when you have this dream, “I want to be a professional cricketer” and the reality hits you. Anyway, then came to study, didn’t know what I wanted to study. My mommy applied for me. I ended up doing B. Social Science. Turns out he wanted to be a high school Maths and History teacher. “I love youngsters, I love educating…. I love those diamonds in the rough, those youngsters who don’t believe they have potential. It’s very idealistic but you gotta start somewhere”. “I enjoy working with young people.” He coaches kids cricket too. On a side note, he mentions that he wants to do TV and radio. He says, he has been told he has a face for TV. Dalin in his gold suit. Yvette: Hobbies? I assume it will be the cricket thing? Dalin: Ag, you know, I have always loved comedy man. 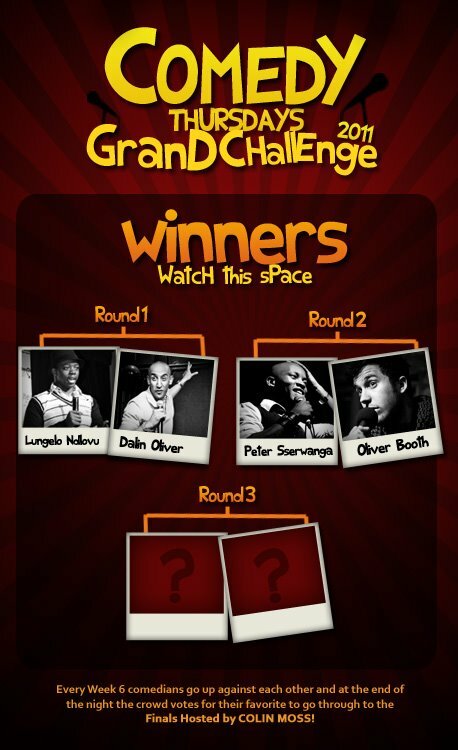 I grew up watching stand-up and watching guys like Marc Lottering, Kurt Schoonraad, Stuart Taylor, Riaad Moosa. All the SA comics. I have been a big fan of all of them. #No favourites. With our diverse culture, each of them hits it from a different angle. And me being exposed to all those cultures, it’s difficult to say(who is his favourite). I do like the ‘out-there’ , quirky comics. Those who are weird about themselves, like Kurt and Nik Rabinowitz. Get this, he (Dalin) never could actually tell a story. He was bad at it. Go figure. He says himself, “a horrible storyteller”. He gained some confidence in public speaking when he took part, on the spur of the moment, in Goodhope FM’s Campus DJ search last year, and that boosted his confidence a little as he was received well by the audience. He then started to write his own material and tested it out on his friends. First attempt at this, he failed miserably, but he worked at it and got better. Obviously. He started gigging last year September. His parents were cool with it, and his mom asked, “Is there money in it?” LOL. My parents would’ve just TOLD me, “There is no money in it”. Dalin and his crew… Jokes. Yvette: Tell us more about your specific style of comedy. Dalin: Difficult question to answer. I speak about things that are relevant to my life. I speak about how I see life as a kid, growing up in Retreat (Southern Suburbs); the culture I was exposed to and how I relate or don’t relate to it and how I see it as funny. I speak about my family etc. I also like to look at contemporary stuff , like technology and how things are changing. (Yes, he isn’t that old, but he says he looks at these changes generationally, based on his experiences). From there, errr, girls. Just my mishaps and weird incidences with them etc. (awkward LOL). Women and how I relate to them etc. I also do a bit of politics, not really, I just touch on it, from a warped angle. Life in general etc… Observational comedy to some it up. Intelligent 🙂 I try to keep it natural, try to make it mine. I want it to be Dalin, I’m very possessive over my material. He has a close circle of friends, his crits, who he trusts for their opinions, other than that, he is not deterred by anybody’s opinion really. Yvette: How often do you write material? Dalin: Depends on varsity and stuff but what I noticed is, every October. Yvette: Do you think you will ever experience ‘writers’ block’ and not generate income and have to beg for money? 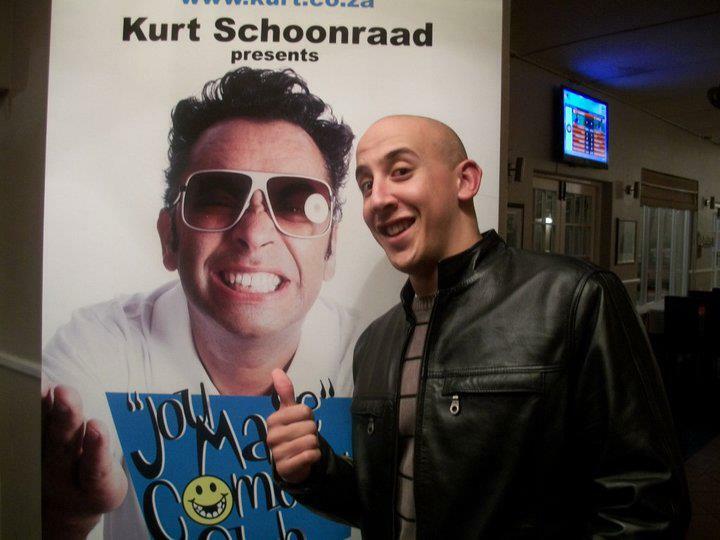 Yvette: Looking at yourself and then other more established comedians like Kurt Schoonraad and Marc Lottering, what do you think the role comedians play in South Africa? I’m sure you can relate this to your thesis you mentioned. Dalin: I haven’t been doing it long enough to say I have a specific role but it’s very important to speak about the reality you come from. You shy away from these things to make it palatable. But comedy is medium in which you can make those unpalatable things, palatable. We can speak about what race is, we can speak about differences, but in a good way. You speak about your reality, and the audience will relate to you. And if it’s observational, then it’s your take on it. Start here: (He points to his heart #how deep). But you can’t only speak about that, you will sound too philosophical. You need to be funny too. Yvette: If we look the race related issues and debates in our country do you think it is appropriate for comedians to continue this trend of making jokes about race etc? Will it not reinforce it? Dalin: There is much debate around this and I think we must talk about it. You know, we are a very young democracy and the race issues are everywhere. But it is also how, the way, you bring it across. If you look at America, they have been doing comedy since the 50’s, so that are allowed to take that step away from race and speak about why a chair is funny. The weird thing is when you speak about race in S.A, that’s where you get your biggest laughs. But it’s more of a cultural thing. I interjected here and agreed wholly with him. I think we can’t avoid yet, and are still too ‘young’ to stray away from race issues completely because there is still so much to talk about. Yvette: This just got very deep. 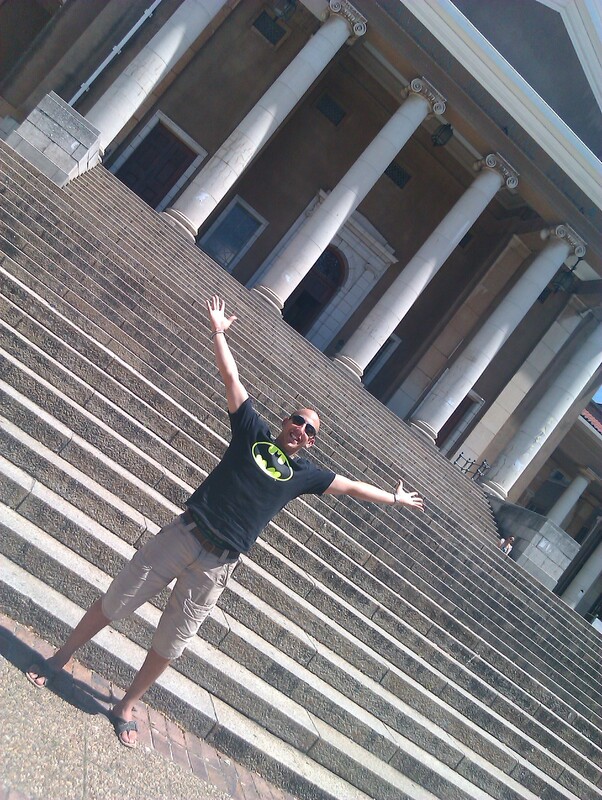 Dalin: It’s your fault, I’m a very philosophical oke (guy). Dalin: You should’ve popped in at humanities during your undergrad, really. LOL. Yvette: What has been you greatest achievement to date? 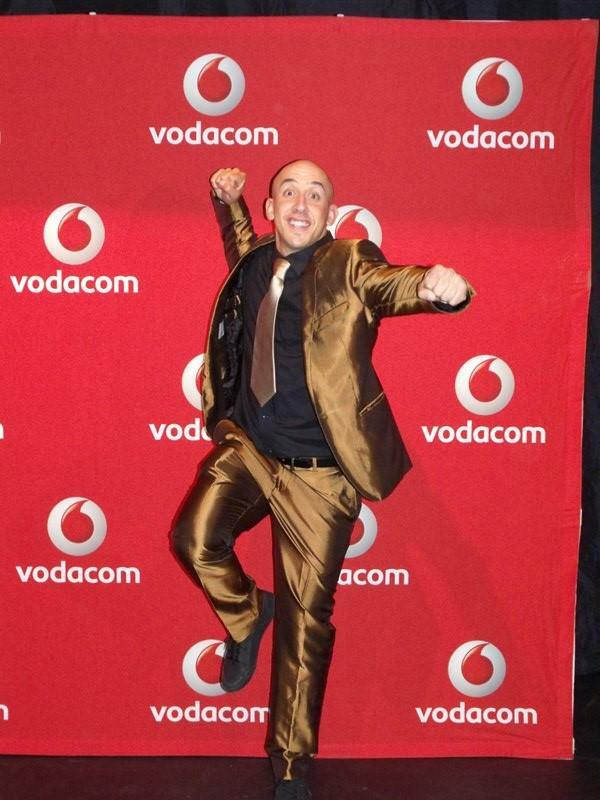 Dalin: 11 July 2011 I was lucky enough to perform at 2 shows at the Vodacom Funny festival at the Baxter theatre, in Cape Town. He explained how he got the gig (through some exposure through working with Stuart Taylor and some other organizes), and just how exhilarated he was when he was told he was afforded the opportunity to perform. He goes on to explain that he had such a great time on stage and those 7minutes were just not enough. Even as he describes the experience of being on that stage at Baxter, I could see him light up and I was not able to hide my smile either. “I killed it, he says”. Dalin had a vision, a goal, to be on Baxter’s stage- and he did. He shares his goals with his dad and this was one of them. I would be stoked too! Yvette: Do you see yourself being one of those veteran comedians like the guys you worked with? Or do you want to branch off into other things? Dalin: Look, you have to have goals and in the next 5 years I am 27, I’d like to be one of the established new acts in South Africa. If not new, then middle (Yvette: middle class?). Yes, somewhere between 3rd and 2nd class. Eventually I would like to be one of the groundbreaking comedians in South Africa. There is a new generation of comics coming through now. He explains that comics like Loyiso Gola, Kurt Schoonraad and David Kau them are the first generation comics that came, post Apartheid. So the second generation of comics are emerging slowly but surely. He reminds me that those guys are there to stay, but they are paving the way for the new comedians to step and explore, due to the other things they get involved in. For example comics making movies and acting etc. Yvette: Do you have a girlfriend? And do you have groupies? Dalin: No, I’m single. I have been getting that question a lot lately. I’m single, and by choice. I’m very, very fussy. Going into relationships, you need to understand one another. Then, especially in comedy, you need the girl to be secure. Not that I’m trying to be wrong when I say this, but you mix with a lot of females at the shows and stuff. But ya, no girlfriend for now. I always say she is at the ‘lost and found’. And he says, ‘no groupies’. Yvette: Where and when can we catch you? Dalin: At present, as Jammie stairs, at 11:25am, with Yvette Adams. You can follow me on twitter: @dalinoliver (he now has 90 followers) and then on FB, my page: ‘Dalin Oliver: The Chameleon’: https://www.facebook.com/thechameleon1 . Next year .. I got some big plans, but I keep a lot to myself, because people think I am weird. See, he is in the finals! 1st December. Don’t forget. Stiek uit (Show up, turn up at the event). LIKE the page, and get more info as to where Chilli Bar is etc: https://www.facebook.com/pages/Chilli-Bar-Comedy-Thursdays/148417625231447?sk=wall. He juggles cricket (especially now that it is cricket season) between gigs, but yeah it’s tough being awesome hey. All his gig info is put on his FB page, so stalk him, he doesn’t mind. During the interview we touched on how the first generation comics are doing great things and creating credibility around the art form that is comedy. It really is an art. Don’t be fooled, you can’t just go on stage and crack jokes. As Dalin says, “No bra, who do you think you are?”. LOL. That would result in an epic fail. We also spoke about movies like SKEEM (Kurt Schoonraad is in here) and MATERIAL (by Riaad Moosa) where these bold new moves by comedians, sort of set the bar higher for the newer comics to aim towards. Stuart Taylor, and Dalin…….. cough. No lies, Dalin uses his ‘awkwardly good-looking face’ to his advantage. He is passionate about life and achieving the goals he has for himself. He sets a great example for our youth to follow. Well, that’s in my opinion anyway. We need go-getters like him who are hungry to rise up to challenges, live their dreams and of course face reality with the right kind of attitude. As Dalin’s plan for next year is to do his Teacher’s diploma, I can see him giving back to the communities in many ways. Although I asked him in the interview about whether or not give does community work, I already had my answer. To me, Dalin is an example of how the community is at work. Positive energy ploughing towards adding smiles, but provoking one’s thought as well. Bonus, he wants to teach? Seriously. Focused. Dalin is one of the most genuine people I have met and I sat laughing, yet in total admiration. A young man, destined for greatness and has achieved great success almost ‘over night’, yet he is so humble. There you have it… In brief. I think I should be on radio or something (hint hint, nudge nudge)- this was indeed the most challenging task ever. Transcribing the audio from my phone without losing a laugh was difficult. Geez. Disclaimer: Many LOL’s had to be excluded due to, well, due to the fact that it would have not looked good at all….. But yeah, this is a learning curve for me. Next time: YOUTUBE. With that said, I would like say thanks Dalin. Stay Real. Great article . 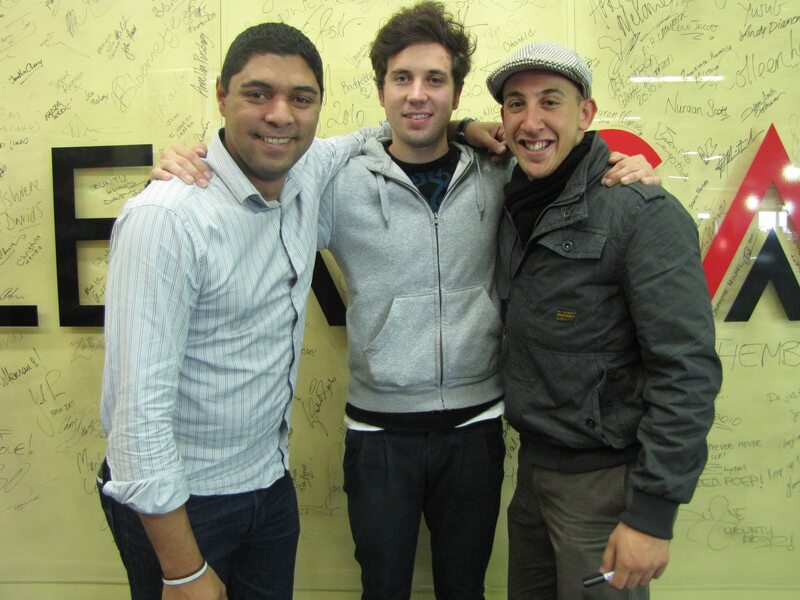 Dalin Oliver fantastic stand up comedian watch out SA . Thanks Wayne. He is really humble. Pity I couldn’t get EVERYTHING in the article, but I know that he learns from every one of you and admires you all. I do too! This guys is going places. For real! Great article. I like your writing style. As for the comedian: well done buddy! Watch this space SA! Thanks Deidre, I appreciate it! I think Dalin is going to the top! <— True story!